An artist's concept of the Comet Siding Spring approaching Mars. The amount dust from the comet's tail was far more than scientists anticipated. Scientists studying the Oct. 19 Mars flyby of Comet Siding Spring said they were shocked at the amount of dust the comet showered down on the Red Planet. While it's too early to say exactly how much dust the comet actually dumped, early estimates peg it at about a few thousand kilograms, according to Nick Scheider, a lead scientist for a dust-measuring instrument used in the study. 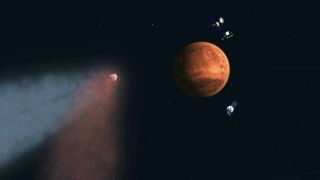 Green said models of the flyby underestimated the size of the comet's dust tail and overestimated how much it would spread out before reaching Mars. NASA positioned its satellites behind Mars to protect them from the dust. In October, NASA scientist Michelle Thaller told Space.com that the dust particles could be traveling at speeds reaching 100,000 mph (27,777 km/h). Images of Comet Siding Spring, taken by the High Resolution Imaging Science Experiment (HiRISE) camera aboard the Mars Reconnaissnce Orbiter. HiRISE measured the comet's nucleus to be 1.2 miles (2 km). "Observing how comet dust slammed into the upper atmosphere makes me very happy we decided to put our spacecraft on the other side of Mars at the peak of the dust tail passage," Green said today. "I believe hiding them like that really saved them." The scientists using the High Resolution Imaging Science Experiment (HiRISE) camera, an instrument aboard the Mars Reconnaissance Orbiter, announced a refined value for the size of the comet's nucleus — the solid, central portion made of rock and ice — of 1.2 miles (2 km), which is smaller than expected. The falling dust particles, just like meteors in Earth's atmosphere, burn up as they go down, so the shower would have created a brilliant light show for anyone standing on Mars at the time. Different elements can create different colors when they burn, and Schneider said it is likely the sky would have had a distinctly yellow glow, due to high levels of sodium. The Mars Reconnaissance Orbiter's Shallow Subsurface Radar (SHARAD) maps the Martian surface from orbit. The image shows two pictures of the Martian surface, taken by SHARAD before (top) and after (bottom) the dust shower. The dust obscured the signals, making bottom surface image blurry. "We all were sort of pressed back in our chairs seeing this booming [magnesium] signal," Schneider said. Magnesium in particular, along with iron are "not what you expect for atmospheric ingredients but they are what you expect from comet dust." The Mars Reconnaissance Orbiter's Shallow Subsurface Radar (SHARAD) spacecraft showed the effects of the dust on the Martian atmosphere. The SHARAD maps the Martian surface by sending radar blips from its orbit down to the ground. The image above shows the surface created by SHARAD, both before (top) and after (bottom) the dust shower. The dust clearly obscured the signals, making its surface image significantly blurrier. Green said scientists believe this is comet Siding Spring's first trip to the inner solar system. The farthest point of its orbit may be 50,000 times the distance from the Earth to the sun, or about 1 light year. Siding Spring is also a remnant of the earliest days of the solar system, and living in such an icy environment may have helped preserve it. If scientists can analyze the comet, they may unlock new secrets from those early days of our local cosmic home. "Never before have we had the opportunity to observe an Oort Cloud comet up close," Green said. While he says four to five Oort Cloud comets enter the inner solar system each year, they move too fast for a satellite to catch up to. Siding Spring was a special case. "Instead of going to the comet, it came to us."